Pin It Now! This summer heat wave has me searching out more cold treats to cool me down. Jimbo's is a small dessert shop in the middle of San Jose's Japantown that serves Bubbie's mochi straight from Hawaii. Not just your standard mochi ice cream from Trader Joe's or Ranch 99, these mochis come in a wide variety of flavors. About 15 flavors a month to be exact, with a couple as special flavors of the month. All 15 flavors this month were: green tea, mango, guava, strawberry, chocolate peanut butter, passion fruit, pistachio, chocolate coconut, lychee, strawberry dark chocolate, vanilla, and ultimate chocolate. Vanilla and ultimate chocolate were the special flavors of the month. While the the standard flavors were good, the taste shockers were pistachio, ultimate chocolate, strawberry dark chocolate, chocolate coconut, and chocolate peanut butter. Although, they don't really tell you what each of the flavors were when they serve you the tray of bubbies, its sort of fun to guess which ones are what. Biting into one of the more "exotic" flavors of mochi (this one is chocolate coconut), you can see the exterior (mochi) is a different color than the ice cream inside. Also, the handmade bubbies have a slightly thinner layer of mochi, which I think works well with the ice cream. Since they are handmade, the mochi is chewier and more delicate in texture. The Jimbo roll here is a must get! A sushi roll made with hot dog ($.75 extra for a hot link) and pickled vegetables (takuan) and a spicy mayo sauce. 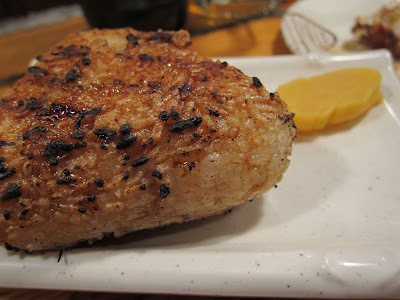 A couple slices of amazingly crispy and fresh tasting takuan are give on the side for some added crunch. The rice to hot dog ratio is spot on. Just looking at this roll makes it seem like it would be heavy, but its actually quite light and a nice snack size. Having had many a spam musubi and sushi roll in my lifetime, I left the store still thinking about how delicious this was. 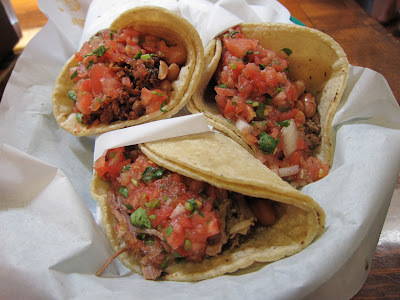 So maybe its not La Palma (see post HERE), or even El Farolito (see post HERE), but Dos Coyotes rings with nostalgia for me. 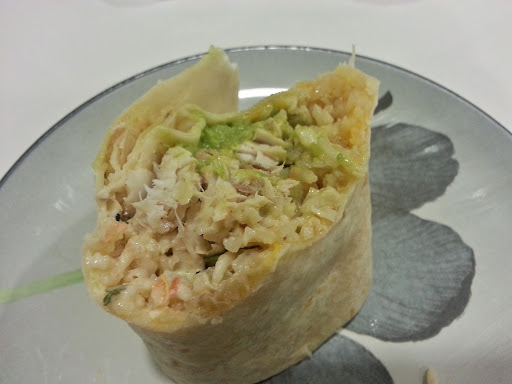 Probably a step above Chipotle, but I don't care, I love it! 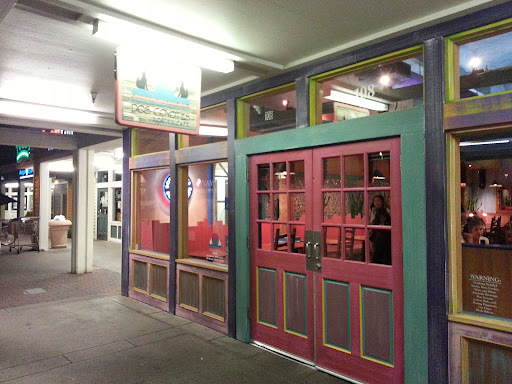 Unfortunately, Dos Coyotes has yet to grace the Bay Area with their prescence with most of their locations north of Davis. 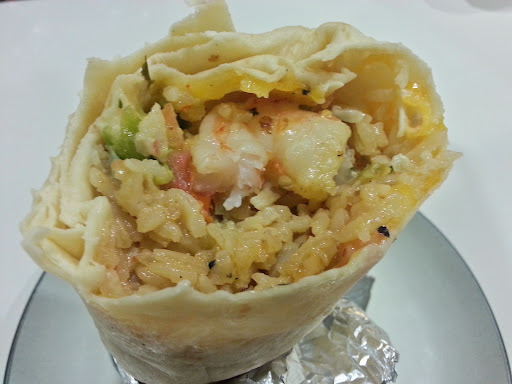 As a poor student, the shrimp burrito was one of the rare treats that I indulged in. Its fluffy rice with plump shrimp (6 to be exact - when you are a student, you count these types of things) and white sauce was amazing! I've often looked for a similar substitute in the Bay Area, but never had much luck. Seoul Gomtang is another example of why its a must to cross the bridge into Oakland for some good food. Most people know Korean food as just grilled meats, but crossing the Bay (also venturing into the South Bay) will get you so much more. Seoul Gomtang offers a couple dishes that I've never really been able to locate in the city, one being gomtang. The kimchee here is scarce, but all quality. From the green onion and cucumber, pickled daikon, and traditional cabbage, each were soaked in spicy flavors and crunchy. Seoul Gomtang has several types of gomtangs. The suk uh gom tang is the mixed beef version with thin noodles. Almost like a pho dac biet (combination #1), this soup has beef tongue, tripe, brisket, essentially the works. The broth is very, very plain and you will need to add something to do, whether it be kimchee, green onions, or salt. The salt actually brings out the subtle beef flavor in the broth. The gori gomtang is a milky broth with ox tail pieces. Compared to the suk uh gom tang broth, this one is a little more flavorful, but no noodles. Simple, but homey, I can see why this place is packed with people sipping this soup. It's also a popular hangover soup, in the same category as pho. SALT! I don't even know when the last time it was that I added salt to a finished food product, especially at a restaurant, but salt is a must for this soup. I'd say anywhere from 1 to 2 spoonfuls is good enough, anything more makes the last couple drops too salty. The pickled jalapenos in spicy soy sauce is used for dipping the pieces of meat. Its the perfect sauce with just the right amount of spicy and saltiness. No Korean meal is complete without a bowl of rice in a metal bowl. I like to scoop the rice into the soup to soak up any last bits of flavor. The mandu (dumplings) here are huge! They are almost the size of fists. Being Chinese, I'm used to small dumplings with delicate skins, these are quite opposite. The wrappers are thick and chewy. Each dumpling is stuffed with egg, chicken, and tofu. They aren't super flavorful, but they do grow on you after the first one. A peek inside the dumpling. Treatbot ice cream truck is a stationary truck located inside of San Pedro Square. This shiny yellow truck churns out some of the best ice cream San Jose has to offer. For the SF folks, it's a mix between Mitchell's famous Asian ice cream flavors (see post HERE) and Humphrey Slocombe wild mixes (see post HERE). 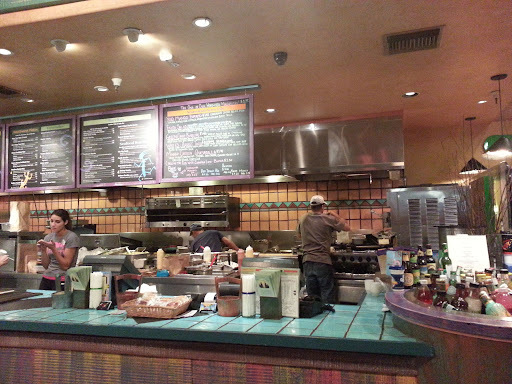 The flavors change on a daily basis with an average of 7-8 flavors every day. Not just your average waffle cone! Bacon bits are pressed into the handmade waffle cone giving a salty twist to the sweet snack. The bottom scoop is banana ice cream speckled with nuts. The top scoop was surprisingly the best one. Avocado ice cream with real chunks of avocado. With many pizzerias (Delfina see post HERE; Beretta, etc ) within walking distance, sometimes its hard to distinguish one pizza place from the next. First thing you notice while seated here is how quiet this place is. 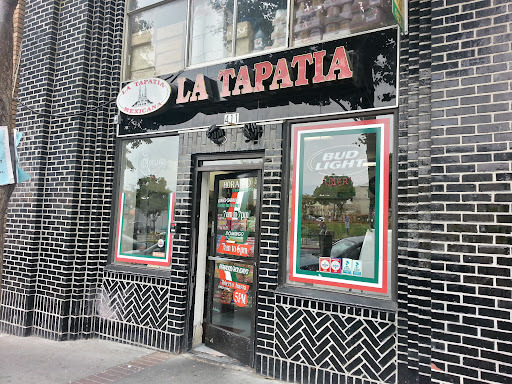 Owned and staffed by deaf servers, its definitely a different SF dining experience. Having been exposed to this environment my whole life, it wasn't anything new to me. The servers are friendly and very attentive, just make sure you look at them when you speak so they can read your lips clearly. There is a some paper and pencil on each table, just in case. 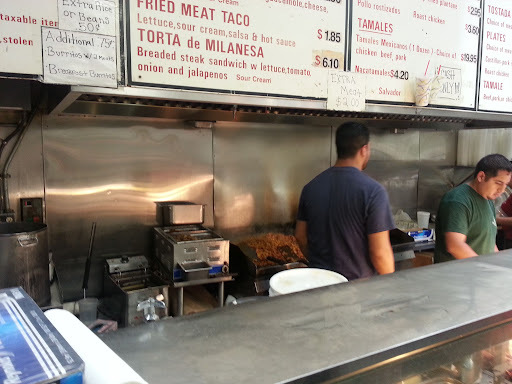 In a city where an average meal is at least $100, I almost forgot what its like to have a bargain meal. 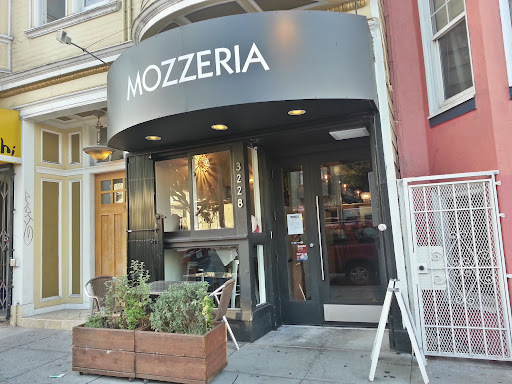 Mozzeria serves dishes a la carte, but on Tues and Weds, they serve up a pre fixe meal. 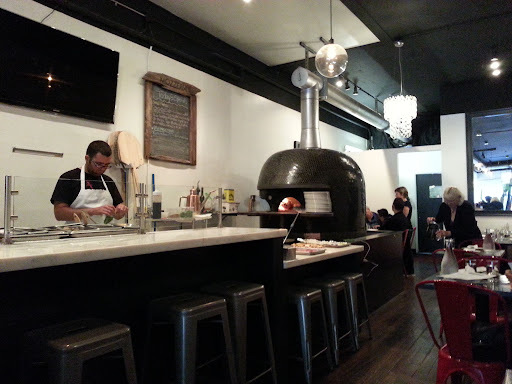 The $39 Tues meal includes a choice of 2 small plates, 1 pizza, 1 pasta, and 1 dessert. 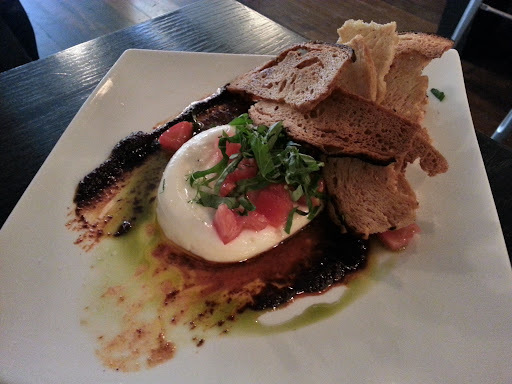 I can never say no to a ball of burrata. For a special menu dinner, this one was quite generous in portion size. 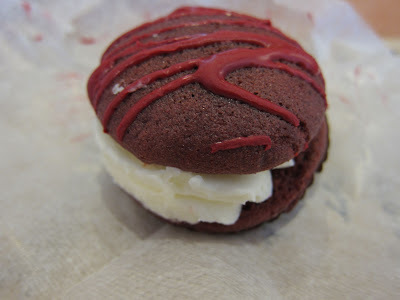 Not as soft and fluffy on the inside as I would have hoped, but it still hit the spot, especially with the chili jam. It gave a nice kick to the subtle dish. Crispy balls of goodness sums of what aracinis are. Deep fried balls of gooey rice and cheese with a nice crispy crust. My first choice of the bucatini wasn't available so I had to default to the gnocchi. Covered in bolognese and fennel with a giant dollop of ricotta on the side, this was not my favorite dish. The balls of dough were on the heavy and dense side. The pizza here is definitely the star of this meal. Super, super thin (possibly the thinnest slice, I've seen in SF) with a nice charred, blistered crust. 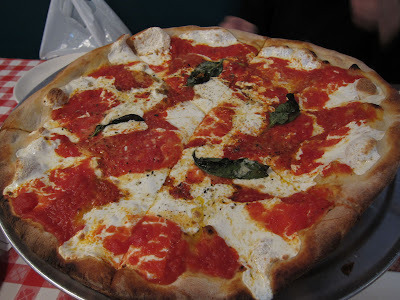 Its just a slice that bursts with amazing flavor, from the tomato sauce to the crust. 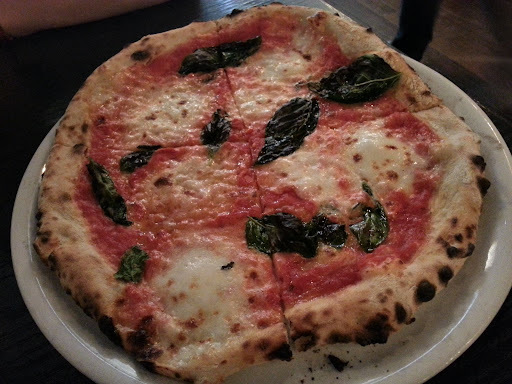 This pizza is some of the best pizza in SF, second only to Pizzeria Delfina. The dessert of the day was the bombolino. 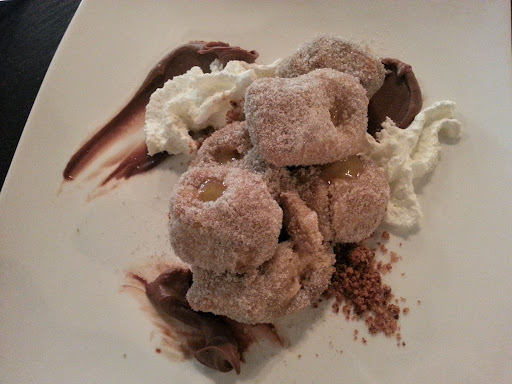 They are fried doughnuts filled with lemon curd and rolled cinnamon sugar. Fluffy and delicious. Suite Foods just moved into the 331 Cortland food court, which is also home to Anda Piroshki (see post HERE). It seems I've been on quite a waffle run lately with Waffle Amore (see post HERE) and Butter & Zeus (see post HERE). Instead of going all the way to TCHO (see post HERE), you can get TCHO sipping chocolate here for $3. The chocolate is so thick you really do have to sip it. It has a sweet fruity, taste with a deeper chocolate finish. You can never go wrong with the traditional Liege waffle. 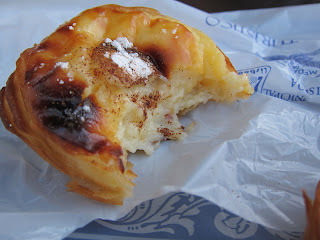 Its sturdy and dense with hints of caramelized sugar bits in the nooks and crannies. My fascination with runny egg may be getting out of control. 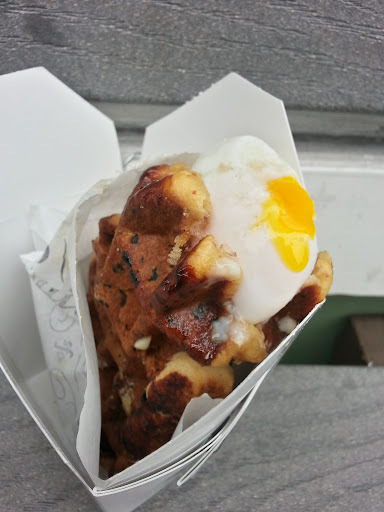 One look at a picture of their poached egg (additional $2) inside their maple bacon waffle and I made it a top priority to eat this asap! The poached eggs are actually precooked ahead of time and then dropped into a pot of hot water then placed ever so gently inside a freshly made maple bacon waffle. A perfectly runny egg with just a dash of salt on top made this salty and sweet combination just that much better. 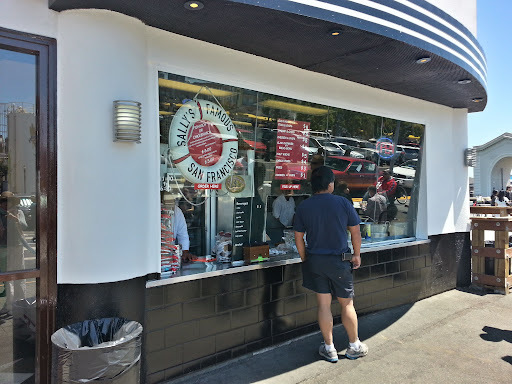 Salty's Famous Fishwich is one of those hidden gems amongst the tourist traps and chain restaurants. The fishwich has got to the best tasting fish sandwich I have ever had. The fish is lightly battered and deep fried. So fresh that the fish just flakes off with every bite. The slaw is light and crunchy with a slight vinegar taste. Its so good that you can even buy a side of it. The fresh, crunchiness reminds me of Bakesale Betty's slaw (see post HERE). Its so good its a candidate for my top ten chomps of the year. For the non fish lovers, there is a chickenwich. Essentially, the chickenwich is the same sandwich as the fishwich, just with chicken instead of fish. The lightly battered fried chicken is good, but just a little dry. The fishwich is MUCH better. 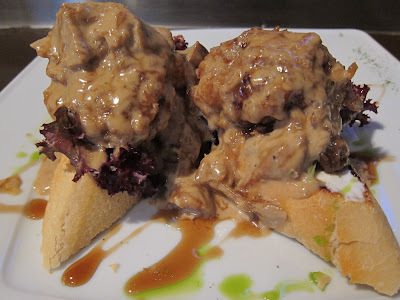 Any place that touts itself as a tapas or even Basque cuisine makes me a little hesitant since I've never found any place that comes close to what I had in San Sebastian. 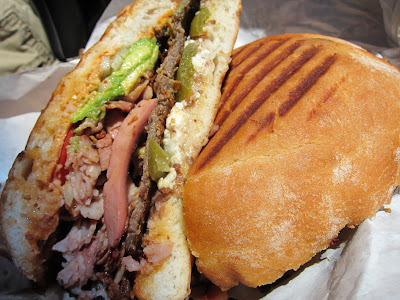 Michael Chiarello took a stab at it with Coqueta. The restaurant is small and quaint with a bright, homey feel. It was fun to look around the restaurant and see small ingredients used as decorations that reminded me of Spain. While the cuisine still doesn't come close to the fabulous food I had in San Sebastian (see post HERE), its the closer than anything I've in SF so far. Yay! Estrella Damn! A taste of a Barcelona beer was just the start of the Basque meal that took me back to memories of my Spain trip. 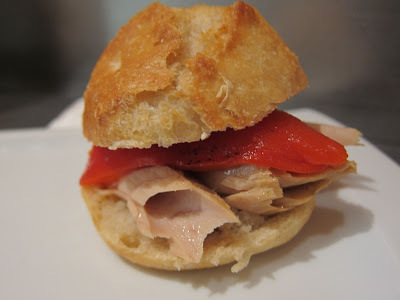 One thing I love about the pintxos in Spain was the plentiful seafood dishes. The calamari were chewy and plated with squid ink aioli and onion aioli. The wood grilled octopus was one of my favorite dishes of the night. The octopus was tender, but chewy with a nice smokey, grilled taste. A little firm, but a little soft, you can never go wrong with fingerling potatoes. At $2.50 a skewer, its a fun way to snack before the rest of the meal comes. Today's skewers choices were (right to left): quail egg "Diablo", pickled mustard seed and jamon serrano; house cured boquerones, white anchovies, olives, pearl onions, guindilla peppers; chorizo, roasted artichokes, and piquillo peppers; jamon serrano, manchego, and apricot-sherry conserva; baby beets, caña de cabra cheese, citrus, and spring onion a la plancha. Trying to save room for the rest of the meal, I only chose 3 skewers (left to right): manchego cheese, quail egg, and chorizo. I decided bypass the most obvious rice dish (paella) and choose the arroz cremosa. 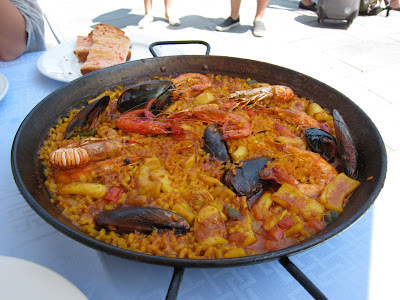 Snaps for using the correct rice (bomba rice) for this dish as well as the paella. The scallops were so lush and tender. 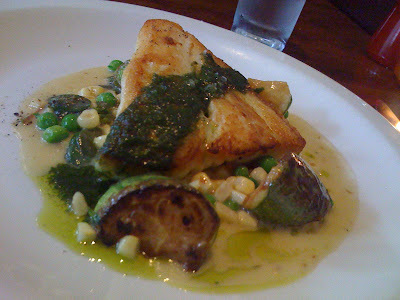 The English peas and sprouts gave this dish a nice fresh taste. The pluma seems to be the most popular dish, making its appearance on almost every table in the restaurant. At $38, this was surprisingly the most expensive dish of the night. The Iberico de bellota pork shoulder loin was lightly covered with honey chili glaze. While the meat was cooked to juicy perfection, I was hoping for some charred or grilled taste to the meat. I found the glaze to be too sweet for the meat and would rather have it with just a dash of salt granules. A bottle of chili glaze is given, in case you prefer your meat even sweeter! Even if you are stuffed, Coqueta offers dessert bites as well as regular sized desserts. Manchego cheesecake served on sticks with caramel popcorn. A nice density with very cheese taste and texture. Another dessert bite was the sangria "pop-rocksickles". An adult popsickle with a sprinkle of poprocks for childhood nostalgia. Cute, fun idea, but hard to eat. Churros con chocolate is a nice way to end the meal. 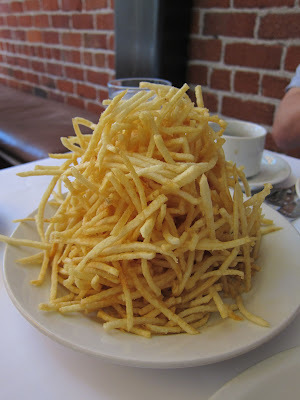 Having had my fill of churros con churros travelling through Spain, I was excited to see this on the menu. The drinkable chocolate was mixed with cinnamon and used for dipping the fried dough. Although the churros had a nice crust, the insides were mushy. The chocolate sauce was much thinner than the ones that I had in Spain. It didn't coat the churros nicely. Pretty disappointing.